Finley Construction is a General Construction company in Kenosha Wisconsin that specializes in Brick Paver Driveways, Patios, walks, Seatwalls & Retaining Walls. Our services also include complete landscape design and installation; including, sprinkler systems, integrated lighting in seatwalls and steps, retaining walls, and spotlighting. Our lawns are established with rough fill and drainpiping, 4-6″ of topsoil, and high quality seed blends for each individual needs with moisture retainer. 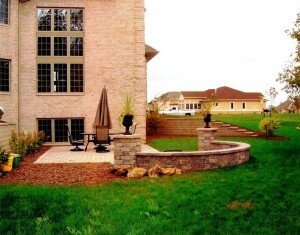 Our fence, deck, basement finishing and remodeling is built to code and expertly installed. All work has a 2 year warranty including lawns, trees, and plants. Plan your own or we will put a plan together for you! We only use quality materials and work with the customer and address their individual needs. We have years of experience to meet your every need and answer your questions! We have our own private nursery where you can browse and pick & tag your own trees & plants. We also outsource from other quality nurseries. All plans are custom made to fit your needs! 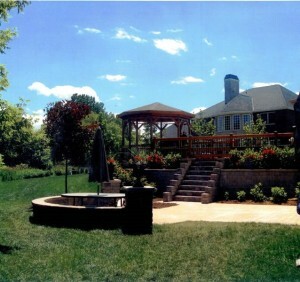 I have worked in construction, electrical, plumbing, HVAC, grading, and landscaping for 30 years. I started my own business in 1995. Since starting my business, I have moved to more personal attention and more innovative designs to suit each client. I meet with each client personally and I am on the jobsite every day working and supervising the job. At Ed Finley Construction we believe that every customer has individual needs so we meet one-on-one with the customer to find out what their individual needs are and plans are custom made to fit your needs. We only use high quality seed and plants that are backed by a 2 year warranty. We have access to a large variety of plants and trees; let us know what you are looking for and we will find the perfect fit for your needs. At Ed Finley Construction when you hire us for your needs; we concentrate on your project until completed!